F.D.N.Y. 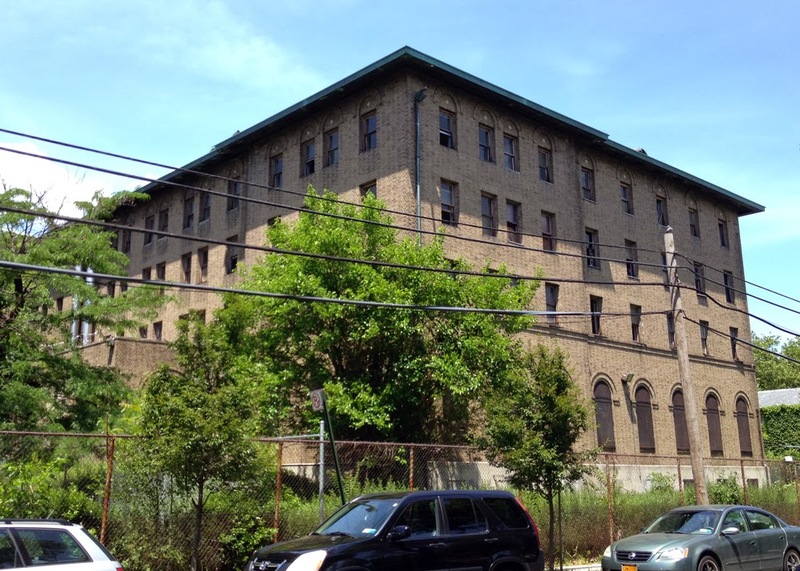 Engine Company 212 began as Engine Company 12 of the Brooklyn Fire Department at 136 Wythe Avenue in 1869. 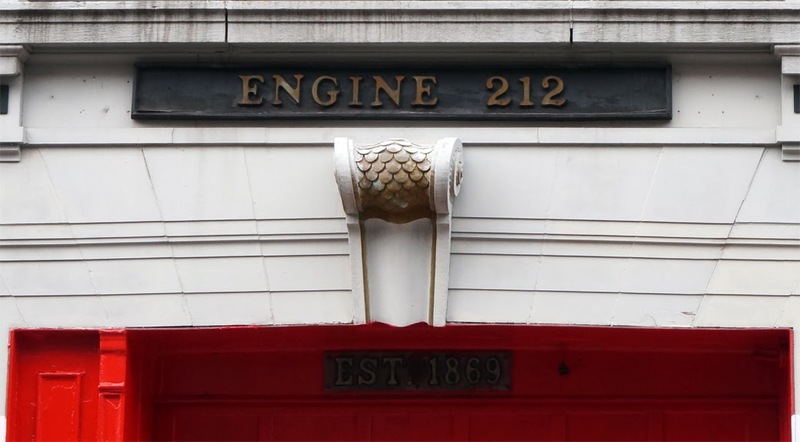 The company was reorganized once the Brooklyn Fire department was assimilated with the Fire Department of New York and became Engine Company Number 212 on January 1st 1913. 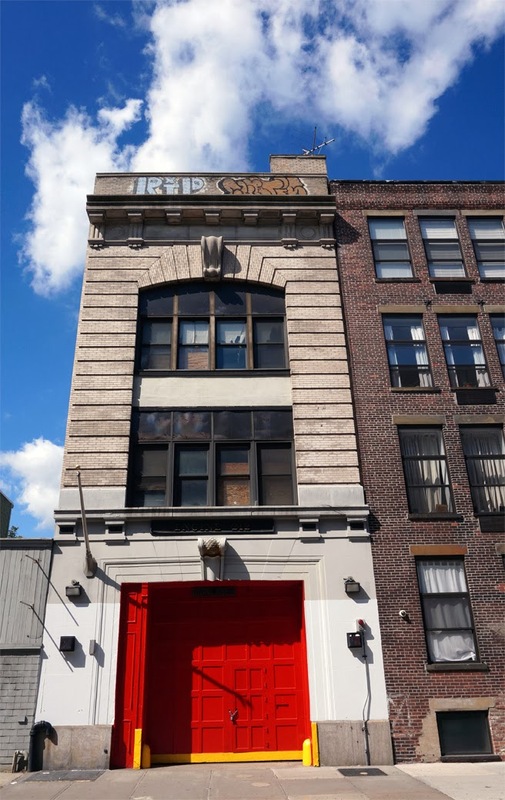 The name “People’s Firehouse” was coined by an NYPD battalion chief who said "We're not going to remove them. It's the people's firehouse." when refusing an order to forcibly remove a group of activists that occupied the firehouse when the city attempted to disband it in 1975. During the 1970s New York City faced financial difficulty and responded by issuing budget cuts thereby reducing city services. The F.D.N.Y. was one of the city agencies affected by the cuts, and in response ordered many firehouses to be closed. Between 1972 and 1977 51 firehouses were closed and in November of 1975 the People’s Firehouse was among 8 of those stations scheduled to be closed. At the same time that fire stations were being closed cases of arson were on the rise as property owners torched their buildings to collect on insurance and escape the financial losses associated with the dropping property values of a city in decline. With many wood frame homes in the neighborhood and arson on the rise, residents were rightfully concerned. In addition to arson the city allowed a policy of “planned shrinkage” to dominate Williamsburg and Greenpoint. 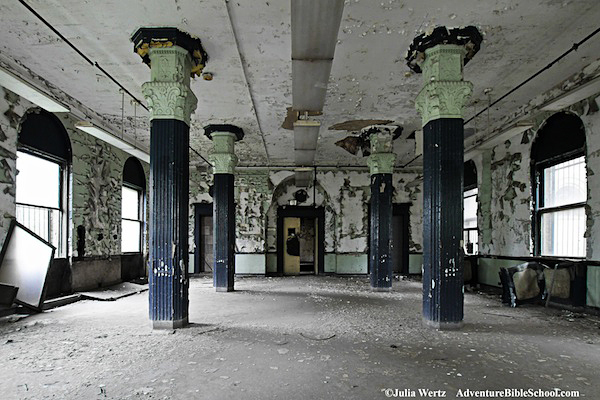 Budgets for city services including fire, police, education and maintenance were reduced and abandoned buildings were often allowed to crumble or burn down rather than be demolished. 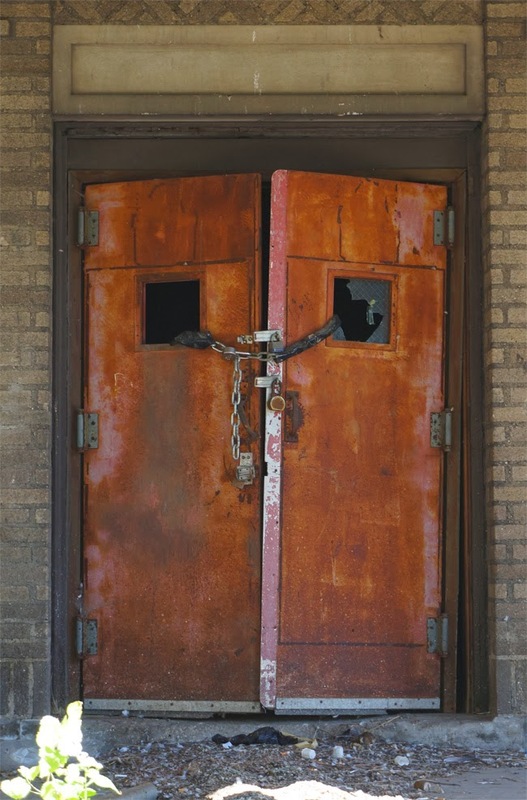 Local citizens saw the closing of the firehouse as an unacceptable loss of fire protection and a sign that the neighborhood was being abandoned by city hall, setting the stage for the battle that ensued. On the day the firehouse was to be closed one of the firemen opposed to the station closing repeatedly sounded the air raid siren in an effort to attract attention to the firehouse and more than 200 neighborhood residents arrived to protest the disbanding of Engine Company No. 212. When the doors to the firehouse were opened at the end of the day's shift and scheduled closing, community activists stormed the building and prevented the firemen and engine from exiting the station. While the firemen were eventually able to leave later in the day, the protestors and fire engine remained in the building. The occupation of the People’s Firehouse lasted sixteen months and included a diverse group of people rotating shifts at the firehouse to prevent the retaking of the station. The group included Boy Scouts, the elderly and entire families. In addition to the takeover of the firehouse activists protested at city offices and in front of Deputy Mayor John Zuccotti’s house, shut down traffic on the B.Q.E., as well as lobbied city hall and the state capital to reinstate the fire company. Eventually City Hall caved into the demands of the community but at first stopped short of restoring the same level of service to the north Williamsburg firehouse. The first attempt to resolve the issue was to move Rescue Company 4 from Maspeth Queens into the firehouse. Like Williamsburg’s Northside residents, Maspeth community members protested and blocked their firehouse to prevent the engine from leaving. After protests and a court order prevented the moving of Rescue Company No. 4 the city resolved the issue by re-commissioning the firehouse as Utility Unit 1. However, the utility unit’s response to local emergency calls was restricted, leading to a continued dispute between the city and local residents. 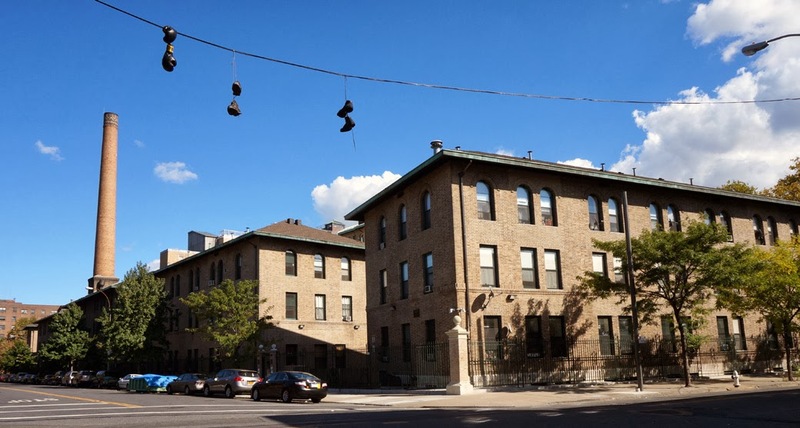 In 1991 the firehouse was occupied once again until engine company 212 was reinstated, restoring the level of service previously enjoyed by the community in north Williamsburg and Greenpoint. The firehouse eventually closed in 2003 due to cuts made by the Bloomberg administration. After the original sit-in the people of the People’s Firehouse created a nonprofit advocacy group (The People’s Firehouse Inc.) led by Adam Venezki. 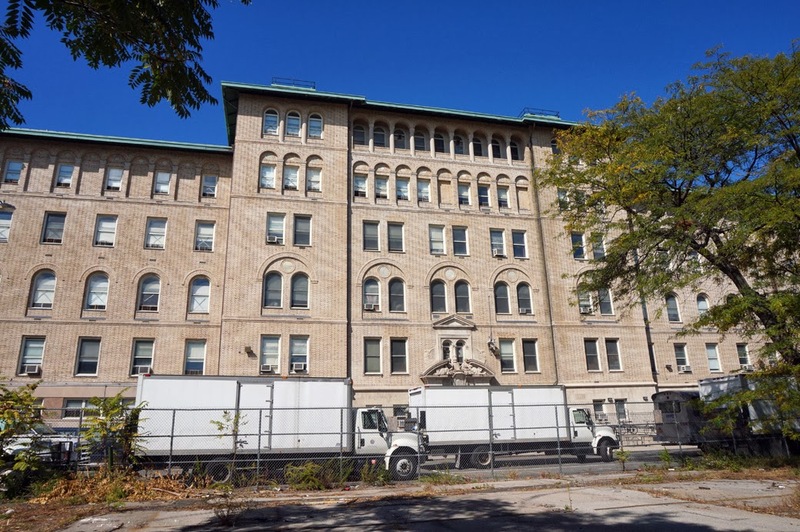 The group advocated for the development of affordable housing and energy conservation programs, as well as provided tenant legal services and job training. 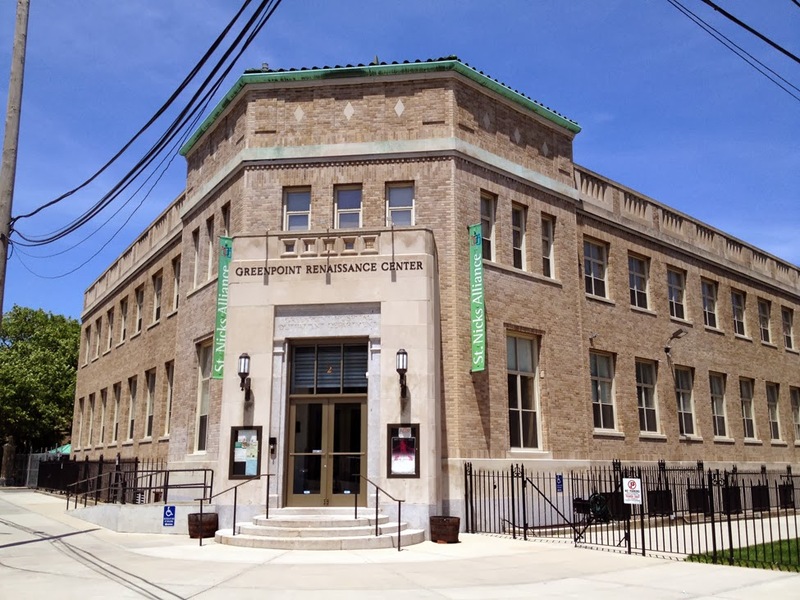 More recently the firehouse was turned into a cultural space and community center for Greenpoint and Williamsburg called the Northside Townhall Community and Cultural Center. Boucher, Mike "Disbanded Companies" Mike Boucher's F.D.N.Y. 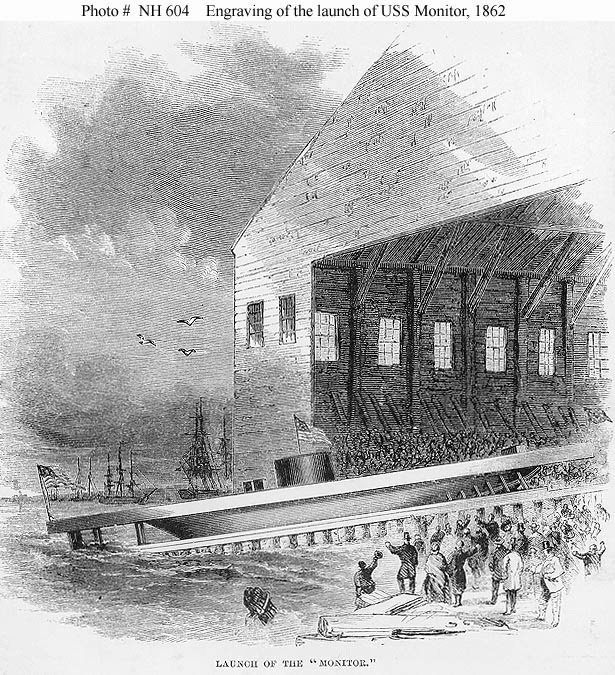 History Page online. Dunning, Jennifer “The People’s Firehouse Hails Victory But Finds Winning Has Its Price” New York Times. 28 November 1977. “New Yorkers Occupy Engine Company 212 (People’s Firehouse), 1975-1977” Global Non Violent Action Database. Online. Davila, Alberta “The Pyrrhic Victory Could Burn Winners” Daily News. 13 December 1979. 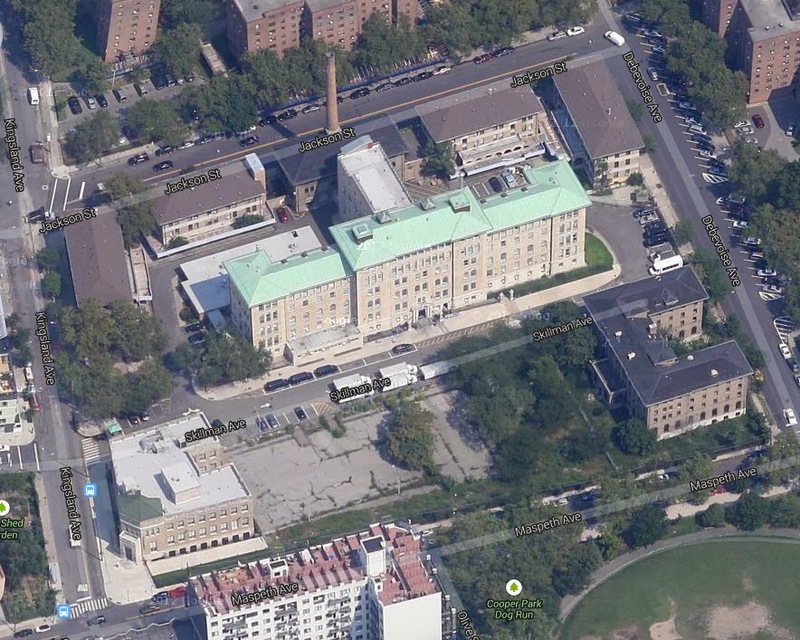 Standora, Leo “Court Gets a B’klyn-Queens Custody Fight” New York Post. 15 December 1976. The land (approximately 10 acres) for what is now Monsignor McGolrick Park was purchased in 1889 for $132,825. The park was originally named Winthrop Park and owed its name to Assemblyman Winthrop Jones who helped obtain the funds to purchase the land. In 1941 the park's name was changed to honor Father McGolrick who was a pastor at St. Cecilia's, as well as a community leader. 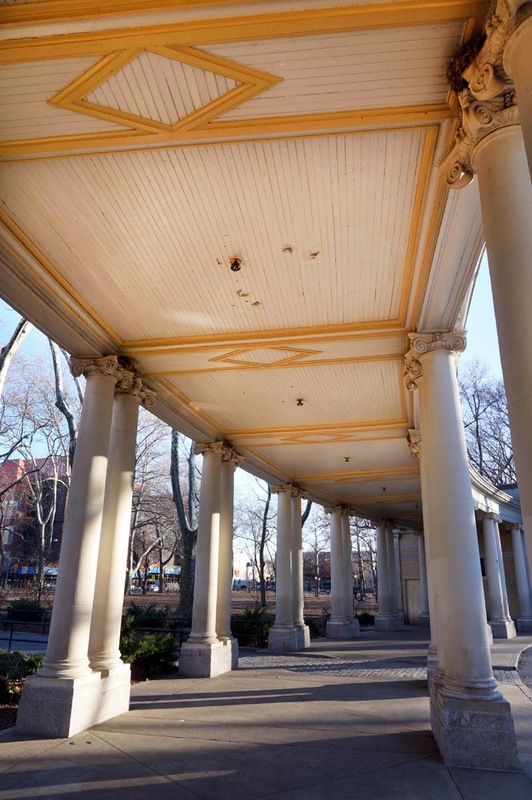 McGolrick Park's focal point is the shelter pavilion (1910), which is built of brick, limestone and wood. 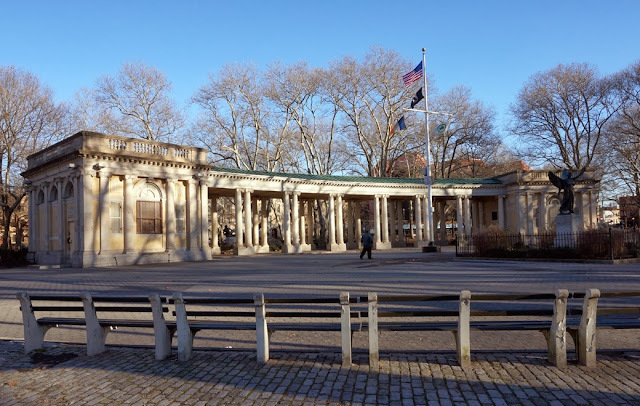 The shelter pavilion was designed by Helmle & Huberty, the same architecture firm that was commissioned to design the Greenpoint Savings Bank. The pavilion's design, although not as large or ostentatious, was based on the Trianon at Versailles. In 1980 the shelter pavilion was added to the National Register of HistoricPlaces and has been recognized as a New York City Landmark since 1966. "The Monitor and the Merrimac"
Along the central axis of the shelter pavilion are two monuments, the World War I memorial (1923) and "The Monitor and the Merrimac" (1939). Designed by Carl Augustus Herber, the World War One Memorial sculpture was built to honor the 150 soldiers from Greenpoint who fought in WWI. 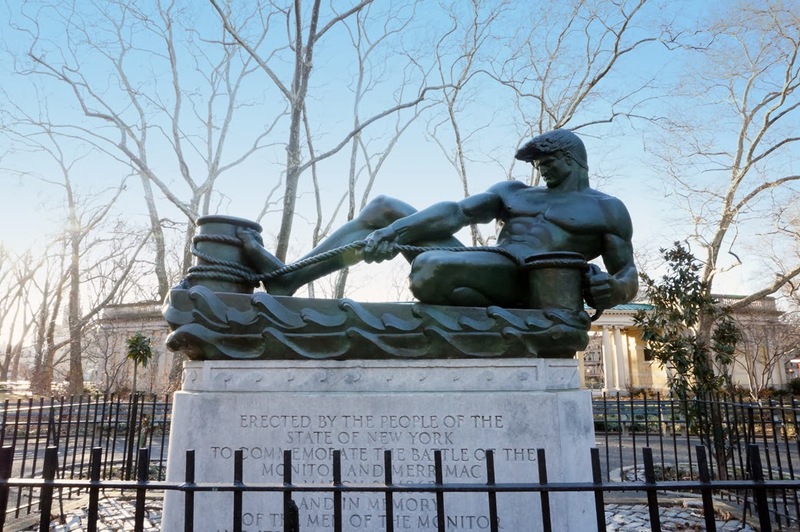 "The Monitor and the Merrimac" monument was designed by sculptor Antonio de Filippo and was built to honor the Monitor's designer, John Ericsson, as well as commemorate the battle between the first two iron clad war ships, the USS Monitor and the USS Merrimac (CSS Virginia). 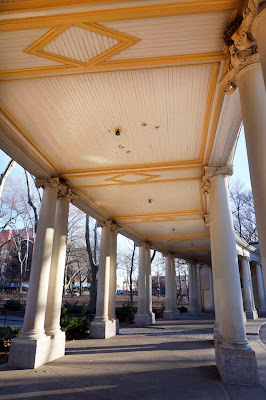 The monuments, as well as the shelter pavilion were restored in 1985. The USS Monitor was built and launched on the banks of Bushwick Inlet adjacent to the East River in Greenpoint. 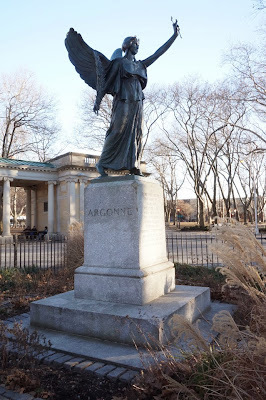 "Monsignor McGolrick Park" New York City Department of Parks and Recreation. Online. Freudenheim, Ellen and Weiner, Daniel P. Brooklyn Where To Go, What To Do, How To Get There. St. Martin's Press, 1991.